Shoei helmets have always held their own little space in my heart. I remember getting my (older style) Shoei VFX helmet. It had stunning graphics, it seemed to be perfectly shaped, and damn was it ever comfy. Since then, I have had many other helmets, however, I still hold that old VFX-W dear. I even put it on occasionally (despite it no longer being fit for use). Many people would ask now, “Why wouldn’t you just buy another Shoei if you like it that much?” Fair question. The truth is, Shoei helmets fell behind in safety technology. For me, there is one thing more important than the value that the brand holds personally. That is safety. Not to say the helmet was no longer good, it just wasn’t as advanced as the others. Well I am happy to say those days are over. Shoei helmets is back with the new VFX EVO! The new Shoei VFX EVO has been engineered and designed to play with all the other modern day big dogs of the helmet world. It comes absolutely loaded with safety and design features that will have riders once again turning to Shoei no doubt. Read more to learn all about this helmet and what it has to offer. You might have noticed a trend in modern helmets. They all seem to be aimed at reducing rotational forces more than they ever have before. Well, M.E.D.S is Shoei’s own way of doing this. It is essentially columns between liners that allow the inner EPS liner to shift a specific amount so that rotational energy can be absorbed. It is similar to a lot of the other rotational force absorbing tech you will find in the market. However this is Shoei’s own in house design so you won’t see it anywhere but within a Shoei helmets. When it comes to liners, Shoei has improved what they already did exceptionally well. There are multiple densities of foam to be found all around the inside of the helmet. Each specifically placed so that weight can be saved where possible. There are also channels inside the foam that help the helmet to breathe. Free cool air flow, and great energy absorption while maintaining a low weight, Shoei knows exactly what a liner should be. 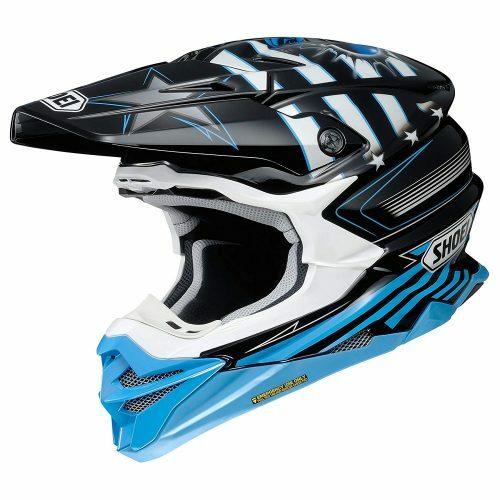 The VFX EVO motocross helmet has one of the most advanced shells that we have seen. It is made up of six hand-laid layers of fiberglass, high performance fibers, and organic fibers. This is Shoei’s lightest and strongest shell. It also is their most elastic which is what helps to absorb the initial crash energy. There are a total of 4 shell sizes which are used to make up the total 6 helmet sizes that the VFX EVO is offered in. 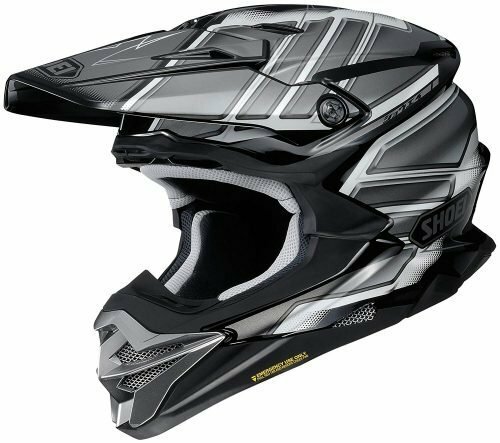 While there are companies such as Fox offering a magnetic visor for safety reasons, Shoei is offering a regular visor with special screws. The polycarbonate visor screws are designed to break under a certain load before the catching and dragging of the visor on the ground can cause harm. This is one of those things that goes to show how much thought is put into helmets nowadays. Every little thing must be thought of because it is the little things that add up to the safest helmet. The obvious things alone aren’t enough. Every good modern helmet should have some sort of emergency release system. So of course, Shoei included one in this helmet. It allows first responders to take the helmet off of the riders head without causing any more damage to the rider. Let’s face it, face plants happen. Shoei jumped into this issue face first (okay I’m done with the puns) with an EPS reinforced chin bar. The foam works just like the liners to absorb the energy being transferred through that area of the helmet. The VFX EVO dirt bike helmet has you fully covered, and that’s a nice feeling. Let’s face it, the old Shoei VFX-W was not the lightest feeling helmet. It wasn’t bad for the time, but it was never the best. Well you can tell that Shoei put in some real work trying to reduce some weight in the new VFX- EVO and it has paid off. A medium comes in at about 1525 grams which is on par or better than most of the other helmet brands. After getting over the weight of the VFX-W, you then had to deal with average or subpar venting. Again, this issue has been corrected with the VFX EVO. It is immediately noticeable that this helmet has better airflow than most. It is cool and dry to ride with. 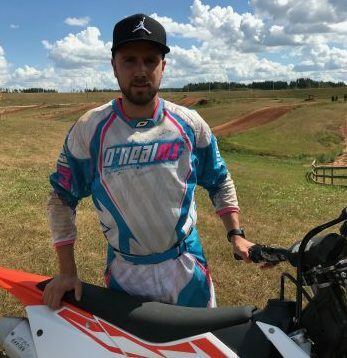 Even after riding and taking a break, you can put the helmet back on without that cold wet feeling that a lot of helmets will force you to endure throughout the day. This is thanks to the 3D Max Dry interior system that is said to absorb sweat twice as fast as nylon. As always with Shoei helmets, I find this helmet extremely comfortable as well. The 3D interior is adjustable so you can get the helmet to feel exactly how you want it to. If you manage to keep the helmet long enough, you can even replace the interior quite easily. However, I found removing it and washing it enough for me. Some of you may have skipped to right to this section to see if I think the helmet is worth it. My answer is yes. This helmet truly ticks all of my boxes and I find it to be one of the most comfortable helmets out there. Am I biased? Maybe a little because of my past love for the VFX-W. However, if you look at everything the new VFX EVO offers and compare it to other helmets of this caliber, it isn’t missing anything. Shoei’s newest motocross helmet offering is surly to leave most riders more than happy.